Activation of T lymphocytes by mouse mammary tumor virus superantigen (vSAg) requires binding to MHC class II molecules. The subcellular location where functional interactions occur between MHC class II molecules and vSAgs is still a matter of debate. To gain further insight into this issue, we have used human epithelial HeLa cells expressing HLA-DR1. Surprisingly, the human cells were unable to present transfected vSAg7 or vSAg9 to a series of murine T cell hybridomas. The defect is not related to a lack of vSAg processing, because these cells can indirectly activate T cells after coculture in the presence of B lymphocytes. However, after IFN-γ treatment, the HeLa DR1+ cells became apt at directly presenting the vSAg. Furthermore, transfection of CIITA was sufficient to restore presentation. Reconstitution experiments demonstrated the necessity of coexpressing HLA-DM and invariant chain (Ii) for efficient vSAg presentation. Interestingly, inclusion of a dileucine motif in the DRβ cytoplasmic tail bypassed the need for HLA-DM expression and allowed the efficient presentation of vSAg7 in the presence of Ii. A similar trafficking signal was included in vSAg7 by replacing its cytoplasmic tail with the one of Ii. However, sorting of this chimeric Ii/vSAg molecule to the endocytic pathway completely abolished both its indirect and direct presentation. Together, our results suggest that functional vSAgs-DR complexes form after the very late stages of class II maturation, most probably at the cell surface. Superantigens (SAgs)3 are small bacterial (bSAgs) or viral (vSAgs) proteins that bind MHC class II molecules and activate up to 20% of the T cell repertoire in a Vβ-specific manner (for reviews, see Refs. 1, 2, 3). SAgs have long been implicated in various diseases as well as in autoimmune conditions (4, 5). They have proven to be useful tools for the appreciation of structural heterogeneity among class II molecules at the surface of APCs (6). MHC class II αβ heterodimers assemble in the endoplasmic reticulum (ER), where they swiftly associate with the invariant chain (Ii) (for reviews, see Refs. 7, 8, 9). This chaperone occupies the peptide binding groove of the newly synthesized class II molecules, preventing the binding of endogenous ER peptides and polypeptides (10, 11, 12). Ii is a type II membrane protein containing endosomal targeting signals through which the class II/Ii complex gets delivered to peptide-rich endosomes (13, 14, 15). In contrast to B cells, DCs from mice deficient for Ii express high levels of class II molecules at their surface (16, 17). Also, in the absence of Ii, class II molecules are efficiently expressed at the plasma membrane of transfected cells (18, 19). However, under these conditions, intracellular trafficking of class II molecules varies between cell lines (20). Once in the endocytic pathway, proteinases sequentially digest Ii, except for the CLIP fragment, which remains in the peptide binding groove of the MHC class II molecule (reviewed in Ref. 21). The exchange of CLIP for an antigenic peptide that will be presented at the cell surface is promoted by HLA-DM (DM) (22, 23). This nonclassical class II molecule exhibits very little polymorphism and resides in the endocytic pathway (24, 25, 26). A cytoplasmic YXXL sorting motif allows DM to accumulate principally in late vesicles (27, 28, 29). The activity of DM is not restricted to CLIP removal, because numerous studies have highlighted its capacity to edit the global peptide repertoire by favoring those of higher affinity (30, 31, 32, 33). Beyond its effect on peptide editing, DM could also play an important direct role in fine-tuning the conformation of class II molecules (34, 35, 36). The best-studied vSAgs are those produced by mouse mammary tumor virus (MMTV). Nevertheless, their crystal structure remains to be determined. MMTV is a type B retrovirus, transmitted horizontally through the milk of infected mothers or vertically once integrated in the germline (reviewed in Ref. 52). They produce vSAgs that are necessary for viral infectivity and virus spread (53, 54). These are type II transmembrane proteins encoded by an open reading frame in the 3′ long terminal repeat (55, 56, 57, 58, 59). The mature MTV vSAg is a 45-kDa glycoprotein that needs to be activated through proteolytic processing (60). The nature of the active fragment remains ill defined; redundancy has been reported regarding the potency of the furin cleavage sites in activating vSAgs (61). Also, cathepsin L was shown to liberate a 27-kDa fragment, which could explain the activity of vSAgs in furin-deficient cells or after mutagenesis of the furin recognition motifs (62, 63). In addition to activating the vSAg, processing would explain the paracrine transfer of a soluble active C-terminal fragment to class II-positive APCs (64, 65, 66). The exact binding site(s) of MMTV SAg on class II molecules remains obscure (67, 68, 69). Also, the intracellular trafficking of vSAgs and the site of class II encounter are still matters of debate. A thorough biochemical analysis of their maturation allowed Grigg et al. (70) to conclude that vSAgs reach the plasma membrane via the default exocytic pathway, independently of MHC class II expression. Class II-vSAg complexes were found exclusively at the plasma membrane and not in the endocytic pathway or the ER. Their observations imply an exclusive association of the vSAg with mature, peptide-loaded, SDS-stable class II molecules. Accordingly, it was later proposed that successful presentation of vSAg7 is conditional to the existence of a diverse, class II-bound peptide repertoire (71). Indeed, endogenous vSAg-induced T cell deletion was not taking place in modified mice expressing class II molecules almost exclusively loaded with CLIP (DM knockout (KO)) or loaded with a covalently linked peptide (Eα52–68). These results contrast with those obtained in vitro by Hsu et al. (72), which suggest that class II-vSAg interactions occur in the ER through a CLIP-like region of vSAg occupying the peptide binding groove. In accordance with such an interaction early in the biosynthetic pathway, they reported that a DM-deficient human B cell line was as potent as its wild-type counterpart in stimulating T cells upon transfection of a vSAg. In this study we show that DR-transfected cell lines differ dramatically in their ability to present MMTV vSAgs and that the mere expression of class II molecules is not sufficient to support presentation to T cell hybridomas. We report that CIITA expression rescues the presentation of vSAg7 by HeLa cells and that the presentation-competent phenotype is dependent on the coexpression of DR, Ii, and DM. The need for class II molecules to access the endocytic pathway coupled to the inactivation of vSAgs in these compartments support a model in which both ligands traffic independently inside the cell. Also, functional complexes probably form at the plasma membrane and only after class II molecules have acquired some presentation-permissive peptides. In Fig. 1⇓C, HeLa, 4N5, and DAP cells were transfected with mtv7- or mtv9-encoding pHβ-Apr1-Neo plasmids (73, 74). Elsewhere, vSAg7 was expressed after transfection of SRαMTV7 expressing the gene for puromycin (obtained from Dr. F. Denis, Institut Armand Frappier, Laval, Quebec, Canada). DR+ HeLa cells do not present vSAgs. 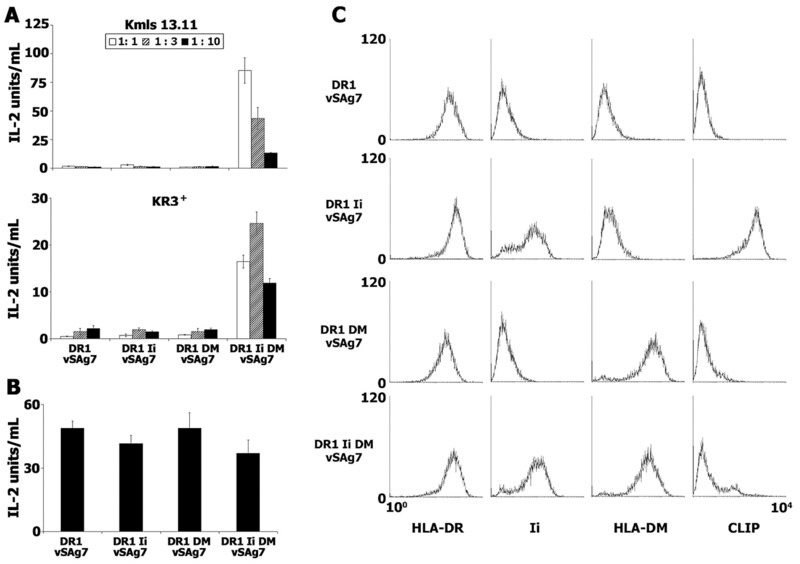 A, Endogenous presentation of vSAg7 by DR1+ HeLa and DAP cells to responsive mouse T cell hybridomas, Kmls13.11 or KR3+. Various APC:hybridoma ratios were tested. B, Assessment of vSAg7 expression by transfer of the activity from HeLa and DAP cells to vSAg− BJAB B cells. BJAB cells were cocultured for 16–20 h with the various vSAg-expressing cell lines in the presence of KR3+. C, Endogenous presentation of vSAg7 or vSAg9 by DR+ human (HeLa and 4N5) or murine (DAP) cell lines or clones to Kmls13.11 or Vβ5no.11 hybridomas. D, Flow cytometric analysis of HLA-DR1 levels of expression on the surface of HeLa and DAP stained with L-243 mAb (▦) or 2.06 mAbs (▪). The mean fluorescence value is indicated. The error bars indicate the SD obtained for each condition, performed in triplicate. pBudDM has been described previously (75). Ii was expressed from pREP4 Iip35 as previously described (76). The chimeric RSV.3 DRβ/DOcyto (DR-LL) has been described previously (77). Ii-vSAg7 chimeric cDNAs were obtained by the PCR overlap extension technique (78). We exchanged the vSAg7 cytoplasmic tail coding sequence for that of either the p33 or p35 Ii isoform to obtain p33cyto-vSAg7 and p35cyto-vSAg7, respectively. A first fragment was amplified from pBluescript (pBS) MTV7 using the universal primer and a fusion primer covering the end of the vSAg transmembrane and the beginning of the cytoplasmic tail of both isotypes of Ii (5′-AGC AAT TGC AGC CTC ATT TGC TGC). The second fragment was amplified from pBS KS+ Iip33 or pBS KS+ Ii p35 (76) using the complementary fusion primer and the reverse primer. The two overlapping PCR products were mixed, and a final PCR was performed using the flanking universal and reverse primers. An EcoRI-XbaI fragment from the final PCR product was cloned into the SRα vector (79) and sequenced. The VS7 mAb against the C-terminal part of mtv7 SAg was a gift from Dr. G. Winslow (Wadsworth Center, Albany, NY) (80). L-243 (ATCC HB-55; American Type Culture Collection) mAb (IgG2a) binds a specific DRα conformational determinant (81). 2.06 is directed against a common epitope on the β-chain of the three HLA-D isotypes, but binds preferentially to the DRβ-chain (82). XD5 (IgG1) recognizes a linear epitope in the β1 domain of all class II molecules (83). BU-45 (IgG1) is an mAb specific to the C-terminal portion of the human Ii (84). Pin.1 (IgG1) (85) recognizes both Ii p33 and p35 cytoplasmic tails. CerCLIP.1 (IgG1) is directed against the N-terminal segment of CLIP (BD Pharmingen). MaP.DM1 (IgG1) is directed against the luminal portion of HLA-DM (BD Pharmingen). 1a3 mAb is specific for a monomorphic region of all HLA-DQ (86). The human Burkitt lymphoma B cell line Raji (ATCC CCL 86; American Type Culture Collection), the EBV-transformed BJAB (87), and the murine B cell lymphoma CH12 (65) were cultured in RPMI 1640 medium with 10% FBS (Invitrogen Life Technologies) and 4 μM 2-ME. Human epithelial HeLa cells (ATCC CCL-2; American Type Culture Collection), HEK 293T cells (obtained from Dr. E. Cohen, University of Montreal, Montreal, Canada), the murine fibroblast cell line DAP (ATCC CRL-1949; American Type Culture Collection), and the DR1+ M1 fibroblast line (4N5) (88) (a gift of Dr. E. Long, National Institutes of Health, Bethesda, MD) were cultured in DMEM. Murine T cell hybridomas were grown in DMEM containing 10% FBS and 4 μM 2-ME (Kmls13.11 (mVβ6; Ref. 89); I1B3 (mVβ1 and mVβ8; Ref. 90)). KR3+ (mVβ8.1) (91) and Vβ5 no. 11 (mVβ5) (68) were grown in RPMI 1640. Stable Raji transfectants were obtained by electroporation as previously described (92). Briefly, 107 Raji cells in 500 μl of RPMI 1640 containing 20% FBS and 15 μg of plasmid DNA were electroporated using a Gene Pulser (Bio-Rad). After 24 h at 37°C, cells were grown for 3 wk under selection using 0.2 μg/ml puromycin. Clones were obtained by limiting dilutions in 96-well plates. DAP cells were serially transfected with HLA-DR1 and vSAg7 to give rise to DAP DR1 vSAg7 clone 3A5 as previously described (74). These cells were transfected with SRα p33cyto-MTV7 or p35cyto-MTV7 plasmids using FuGene 6. 4N5 cells were supertransfected using the calcium phosphate method as previously described (74, 93). HeLa DR1 cells were kept under selection for DR1 expression by adding 500 μg/ml geneticin (G418 sulfate; Invitrogen Life Technologies). They were stably transfected with SRα MTV7 using FuGene 6 (Roche) to obtain the HeLa DR1 vSAg7. Cells were then transfected with pBud DM and/or pREP4 Iip35. Selection was applied 48 h after transfection (0.2 μg/ml puromycin, 160 μg/ml zeocin, and 55 μg/ml hygromycin). HeLa CIITA cells (94) were transfected with SRα MTV7 to obtain HeLa CIITA vSAg7 cells. HeLa DR-LL cells (HeLa DRαTM+DR/DOβcyto) (77) were supertransfected with SRα MTV7 with or without pREP4 Iip35, as described above, to obtain HeLa DR-LL vSAg7 and HeLa DR-LL vSAg7 Ii cells. For transient expression, HEK 293T cells were transfected with the calcium phosphate precipitation method using 10 μg of SRα p33cyto-MTV7 or p35cyto-MTV7 plasmids. Cells were analyzed 48 h after transfection. Total lysates were prepared by sonication of 107 cells in 1 ml of lysis solution (20 mM Tris-HCl (pH 7.0) and 150 mM NaCl). After sonication, Triton X-100 was added to a final concentration of 1% as described previously (76). The lysate equivalent of 250 × 103 cells was loaded onto 10% SDS-PAGE. Proteins were transferred to Hybond ECL nitrocellulose membranes (Amersham Biosciences) and incubated with primary Abs in PBS containing 5% (w/v) skimmed dry milk and 0.1% Tween 20. Primary Ab was probed with HRP-conjugated secondary Ab (BIO/CAN Scientific) and was revealed by ECL (Amersham Biosciences). Total RNA was isolated using TRIzol (Invitrogen Life Technologies) and analyzed as described previously (65, 95). The entire cDNA for vSAg7 was purified and labeled with α-32P using the Ready-to-Go labeling kit (Pharmacia Biotech). The control GAPDH cDNA was provided by Dr. P. Belhumeur (University of Montreal, Montreal, Canada). Cells were washed in PBS and incubated with primary Abs in complete cell culture medium or PBS. After 30 min at 4°C, cells were washed twice in PBS and incubated for another 30 min at 4°C with Alexa 488-conjugated goat anti-mouse IgG (Cedarlane Laboratories) in PBS. Cells were washed twice and analyzed by flow cytometry on a FACSCalibur (BD Biosciences). Intracellular staining for HLA-DM and Ii was conducted on cells fixed in 4% paraformaldehyde and permeabilized with saponin (76, 77) using MaP.DM1 or BU45 mAbs and goat anti-mouse IgG. Viral SAg7-expressing APCs were cocultured at different ratios with 5 × 104 T cell hybridomas. IL-2 production was determined by the ability of the coculture supernatant to sustain the proliferation of the IL-2-dependent T cell line CTLL-2 (ATCC TIB-214; American Type Culture Collection) as measured by [3H]thymidine incorporation (68). For indirect presentation, expressing cells (donors) were cocultured with BJAB or CH12 cells (acceptors) and responder T cell hybridomas at ratios of 1:1:1. Approximately 2 × 106 HeLa DR1 vSAg7 cells were cultured in medium supplemented with various concentrations of recombinant human IFN-γ (0.5–5 ng/ml; BD Pharmingen) for 5 days before T cell stimulation assays. Transfected mouse fibroblasts expressing HLA-DR molecules are capable of vSAg presentation (95). Moreover, the responsive human Vβ repertoire was similar to that described in the mouse (74). In the process of characterizing the molecular interactions between DR and SAgs, we generated vSAg7+ populations of DR1-transfected HeLa cells (HeLa DR1 vSAg7). To our surprise, these transfectants could not present the vSAg7 to the murine T cell hybridomas Kmls 13.11 (mVβ6) and KR3+ (mVβ8; Fig. 1⇑A). The negative result obtained with HeLa was unexpected, because expression of the exact same class II αβ cDNAs in DAP cells triggered a strong T cell response. We used three different APC:hybridoma ratios, and control DAP DR1 vSAg7 cells were effective at all concentrations. We addressed the possibility that the MTV vSAg expression or activity was much reduced in human cells compared with mouse cells. Because the vSAg7-specific VS7 mAb staining was negative on both populations when analyzed by flow cytometry (data not shown), we capitalized on the ability of vSAg-producing cells to transfer the activity to vSAg-negative APCs (65, 66). Fig. 1⇑B shows that in the presence of vSAg7-negative CH12 murine B cells, HeLa DR1 MTV7 cells can trigger a T stimulation as efficient as DAP DR1 vSAg7 cells. Although the exact mechanism remains to be characterized, such indirect presentation is probably the result of a successful paracrine transfer (64, 65, 66), and this strongly suggests that not only do HeLa cells express the vSAg, but it is also processed adequately. We extended our initial observation to vSAg9 produced by MMTV9 (96). New independent transfections were obtained for both vSAg7 and vSAg9, and clones were picked. Compared with DR+ DAP cells expressing vSAg7 or -9, none of the vSAg+ HeLa clones could stimulate the specific hybridomas (Fig. 1⇑C), whereas all triggered an efficient response in the indirect coculture assay (data not shown). These results confirm that HeLa DR1 cells cannot present vSAgs. To rule out that this lack of presentation was due to the epithelial nature of HeLa cells and to determine whether this phenomenon could be observed in other cell types, we used the DR1+ M1 fibroblasts called 4N5 (88). Fig. 1⇑C (left panel) shows that 4N5 cells stably transfected with vSAg7 were unable to stimulate the Kmls 13.11 T cell hybridoma. A trivial explanation for the defect observed with HeLa would be that these cells do not express sufficient levels of class II molecules (97). However, surface stainings with the pan-DR L-243 mAb showed that both DAP and HeLa cells express significant and comparable levels of class II molecules (Fig. 1⇑D). In addition, an independent vSAg+ DAP cell population expressing much lower levels of class II molecules triggers an efficient response from those T cell hybridomas (data not shown). Interestingly, although the DR expression is quantitatively very similar, the 2.06 mAb staining is much stronger on DAP cells (Fig. 1⇑D). The 2.06 mAb binds to the β-chain of all human class II isotypes, but would not recognize class II superdimers (98). The significance of this result is not clear, but it supports the idea that class II molecules are qualitatively somewhat different among various cell lines (6, 46, 89). The presentation of vSAgs was suggested to be dependent on a diverse repertoire of class II-bound peptides (71). Because a fraction of the class II molecules in HeLa and DAP cells are bound with large polypeptides in the absence of Ii, we verified whether HeLa cells express some SDS-stable compact heterodimers containing short peptides and migrating at 55 kDa on immunoblots (10, 46, 99). Fig. 2⇓A shows that nonboiled lysates prepared from both HeLa DR1 and DAP DR1 cells contain stable dimers recognized by the DRβ-specific XD5 mAb. Although such analysis does not give insights into the diversity of the peptide bound to DR, it rules out the absence of compact forms as a possible explanation for the behavior of HeLa cells. Importantly, DAP, HeLa, and M1 cells transfected with DR1 are all very efficient in stimulating the Vβ8+ I1B3 murine T cell hybridoma in the presence of the bSAg staphylococcal enterotoxin B (SEB), ruling out a general Ag presentation defect (Fig. 2⇓B). Compact SDS-resistant DR molecules on transfected HeLa cells. A, Boiled (B) and nonboiled (NB) cell lysates were separated by SDS-PAGE and analyzed by immunoblotting using XD5 mAb. B, Dose-response stimulation of I1B3 murine T cell hybridoma by the bSAg SEB presented on DAP DR1 (♦), HeLa DR1 (□), and 4N5 (▵) cells. The ability to present MTV SAgs is certainly not restricted to the mouse system, because class II-positive monkey (COS) and hamster (CHO) cells have been successfully used in the past (62, 66). Thus, we specifically addressed the role of the class II Ag processing machinery in vSAg presentation. The class II pathway is constitutively active only in professional APCs, but is strongly inducible in nearly all cells by IFN-γ. This pleiotropic cytokine affects all aspects of Ag processing and presentation, because it regulates the expression of >200 genes (100). We treated the inept HeLa DR1 vSAg7 cells for 5 days with IFN-γ and analyzed class II expression by flow cytometry (Fig. 3⇓A). High levels of endogenous HLA-DM and -DQ were observed, whereas HLA-DR was clearly up-regulated due to expression of the homozygous endogenous HLA-DRB* 0102 genes (101). These cells were capable of endogenous vSAg7 presentation to Kmls 13.11 and KR3+ T cell hybridomas (Fig. 3⇓B and data not shown). This increased presentation could be caused by up-regulation of critical molecules involved in either the class II maturation or the processing of vSAg. Although the latter possibility cannot be formally excluded, it does not concur with the fact that HeLa DR1 vSAg7 cells do not need this cytokine to produce functional vSAg7 and that IFN-γ did not increase presentation in the presence of BJAB (Fig. 3⇓C). IFN-γ restores presentation of vSAg7 by HeLa cells. A, Flow cytometric analysis of HeLa DR1 vSAg7 cells treated (solid black line), or not (filled curve), with 2.5 ng/ml human rIFN-γ for 5 days and stained for surface expression of DR (L-243) and DQ (1a3). Cells were permeabilized and stained for DM (Map.DM1). B, HeLa DR1 vSAg7 cells were treated with IFN-γ for 5 days and tested for their capacity to stimulate the Kmls13.11 T cell hybridoma at different APC:responder T cell ratios as indicated. C, Effect of IFN-γ on vSAg7 transfer from HeLa DR1 vSAg7 to BJAB. IL-2 production by the Kmls13.11 hybridoma was measured after transfer of vSAg7 with or without (w/o) BJAB. As a first step in deciphering the mechanism of IFN-γ action and knowing that in its life cycle the MMTV primarily infects B lymphocytes, we tested endogenous presentation via the human Raji B cell line (54, 102, 103). These cells express all the class II processing machinery under control of the CIITA. The expression of this essential coactivator is constitutive in professional APCs and is induced by IFN-γ in almost all other cells (104). The vSAg7-encoding construct was electroporated in Raji cells, and total mRNA from the stably transfected clone 2H8 was analyzed for SAg expression. Fig. 4⇓A shows that overall, the B cell transfectant expresses much less vSAg7-specific mRNA than do HeLa DR1 cells. However, functional assays showed that Raji cells are fully capable of presenting the vSAg7 to the two T cell hybridomas (Fig. 4⇓B). Viral SAg surface expression was detected on Raji 2H8 by flow cytometry using the VS7 mAb (Fig. 4⇓C). We were unable to detect vSAg7 expression on HeLa cells. However, other potent cell lines present vSAg7, but do not stain with the VS7 mAb (see below), suggesting that many factors contribute to the display of the epitope. Taken together, these results suggest that besides class II molecules, expression of additional genes under the control of CIITA is required for vSAg presentation. Raji cells present vSAgs. A, Relative vSAg7-specific mRNA expression was measured on Northern blots. Raji SRα represent mock-transfected cells. The constitutive gapdh transcription is shown as a control for mRNA loading. B, Endogenous presentation of transfected vSAg7 to T cell hybridomas Kmls13.11 and KR3+ at various APC:responder T cell ratios as indicated. C, Flow cytometric analysis of vSAg7 cell surface expression on Raji and HeLa cells using the VS7 mAb. Background fluorescence (filled curve) is obtained by staining Raji SRα and HeLa cells with VS7 mAb. The staining of vSAg7+ cells is shown in the black solid line. 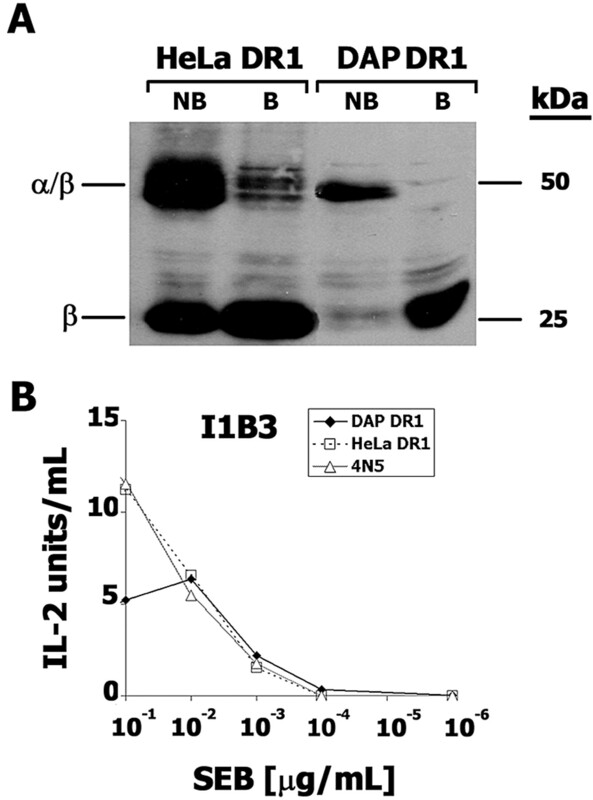 D, IL-2 production by Kmls13.11 T cell hybridoma in response to HeLa CIITA cells transfected (CIITA vSAg7), or not (CIITA), with vSAg7 for various APC:T cell hybridoma ratios. Stimulation with the negative control DR1 vSAg7 is also shown. E, Dose-dependent inhibition by L-243 of T cell stimulation by vSAg7-transfected HeLa CIITA. To narrow down the list of molecules capable of restoring efficient presentation, we supertransfected CIITA into vSAg7-expressing HeLa cells. These cells became fully apt at presenting the endogenous vSAg to Kmls 13.11 (Fig. 4⇑D). To relate to our HLA-DR transfectants and given the fact that CIITA up-regulates the expression of all classical class II isotypes (Fig. 3⇑A), it became important to assess the relative importance of DR for the presentation of vSAg7 by HeLa CIITA cells. The anti-DR mAb L-243 almost completely inhibited T cell activation in a dose-dependent manner (Fig. 4⇑E). DP- and DQ-specific mAbs did not affect the level of stimulation, confirming that these isotypes do not efficiently present vSAgs (95) (data not shown). Taken together, these results suggest a direct implication of MHC class II Ag processing machinery in vSAg presentation. CIITA was shown to affect the expression of a large panel of genes implicated in diverse functions, such as cell migration, differentiation, and proliferation (105). Although many different mechanisms could potentially contribute to the CIITA-mediated enhanced vSAg presentation, we focused our efforts on the role of the intracellular class II chaperones. HLA-DM and Ii are strongly up-regulated by CIITA and play a crucial role in the trafficking of class II molecules and in the selection of their peptide repertoire. First, we stably transfected DM into HeLa DR1 vSAg7 (HeLa DR1 DM vSAg7). Even though vSAg7 transfer to BJAB remained high, this new population could not directly activate the two T cell hybridomas (Fig. 5⇓, A and B). Similar results were obtained using cells transfected with Ii and sorted for high levels of CLIP surface expression (HeLa DR1 Ii vSAg7; Fig. 5⇓C). However, when Ii and DM were cotransfected (HeLa DR1 Ii DM vSAg7), the stimulation increased dramatically for both T cell hybridomas used (Fig. 5⇓A). An efficient stimulation was also observed using independent transfections where vSAg7 and DM were cotransfected into HeLa DR1 Ii cells (data not shown). Together, these results strongly point to a role of class II-bound peptides in vSAg presentation. 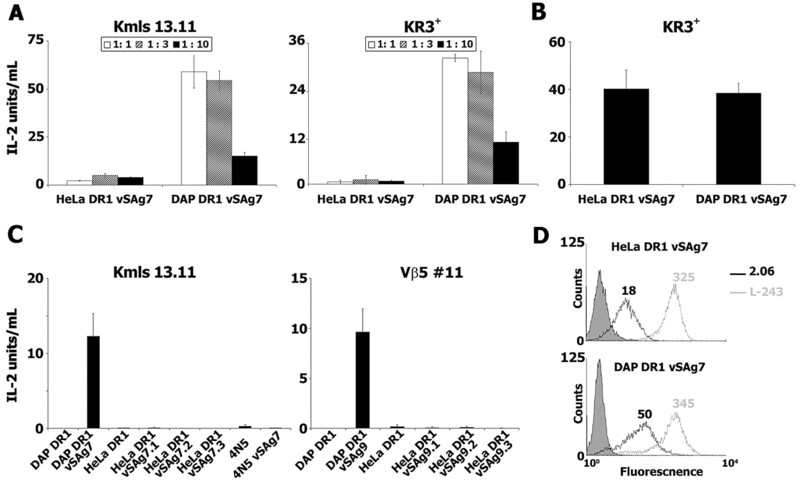 Coexpression of DM and Ii rescues vSAg7 presentation by HeLa DR1 cells. A, Endogenous presentation of vSAg7 by DR1+ HeLa and DAP cells to responsive mouse T cell hybridomas Kmls13.11 or KR3+ for various APC:T cell hybridoma ratios. B, Assessment of vSAg7 expression by transfer of the activity to BJAB cells after coculture for 16–20 h with the various vSAg-expressing cell lines in the presence of KR3+. C, The expression of HLA-DR (L-243) and CLIP (CerCLIP.1) at the cell surface was analyzed by flow cytometry. For HLA-DM (Map.DM1) and Ii (BU45) stainings, cells were first fixed and permeabilized. In light of the functional role of HLA-DM, we hypothesized that class II molecules must travel to the endocytic compartments to acquire the capacity to present vSAgs. Sorting of class II to endosomes is assured by Ii, which bears two leucine-based motifs in its cytoplasmic tail (15, 106). We reasoned that the need for Ii could be bypassed by introducing such a signal in the tail of HLA-DR. To achieve this, we replaced the cytoplasmic tail of DRβ by that of HLA-DOβ. This chimeric molecule (DR1-LL) contains a functional dileucine motif, which results in accumulation not only at the plasma membrane, but also in lysosome-associated membrane protein-1+ intracellular compartments (77). However, HeLa DR1-LL vSAg7 cells did not stimulate T cell hybridomas despite the efficient transfer of the activity to a B cell line (Fig. 6⇓). Interestingly, coexpression of Ii in these cells allowed the efficient direct presentation of vSAg7. These cells express class II levels similar to their nonstimulating counterpart (Fig. 6⇓A). Also, the cell surface staining with CerCLIP.1 demonstrates that they express copious amounts of CLIP-class II complexes. These results confirm that class II molecules must travel to late endocytic compartments before acquiring the ability to present vSAgs. An ectopic endosomal sorting motif in the DRβ tail allows vSAg presentation. A, Flow cytometric analysis of CLIP (CerCLIP.1) and HLA-DR (L-243) expression at the surface of HeLa transfectants. 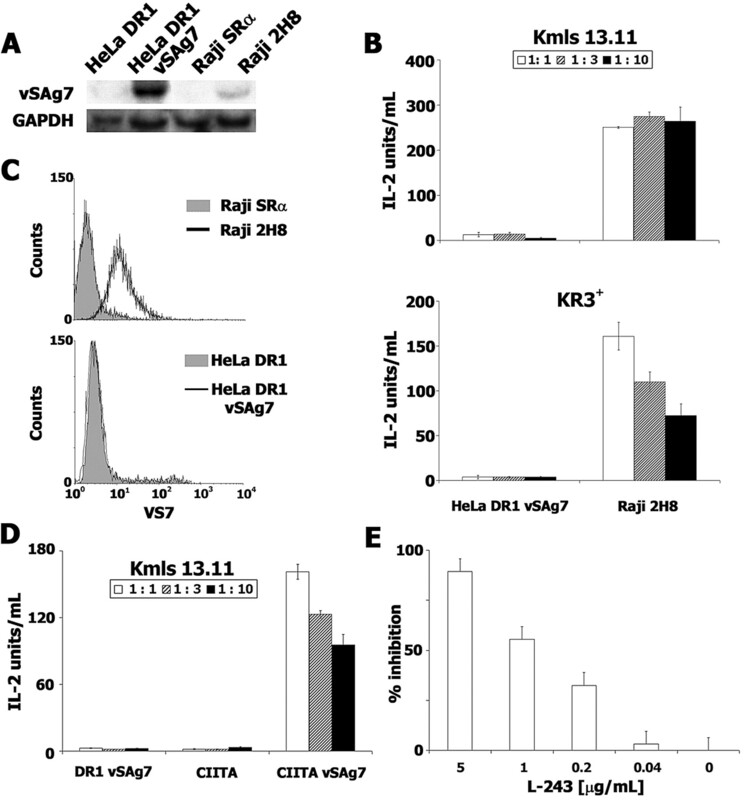 B, Endogenous presentation of vSAg7 by various ratios of HeLa cells to responsive mouse T cell hybridomas Kmls13.11. C, Assessment of vSAg7 expression by transfer of the activity to BJAB B cells cocultured for 16–20 h with the various vSAg-expressing cell lines in the presence of KR3+. Given the importance of targeting the class II molecules to the endocytic pathway, we investigated the possibility of increasing the efficiency of presentation by sorting the vSAg7 to endosomes. Just like Ii, the endogenous MMTV superantigens are type II transmembrane proteins (59). Thus, we swapped the cytoplasmic tail of vSAg for that of Iip33 or p35 and tested the capacity of these chimeric molecules to activate T cells. For these experiments, we used DAP cells, which are fully competent for both direct presentation and transfer of vSAgs. Surprisingly, the stably transfected p33 cyto-vSAg7 and p35 cyto-vSAg7 chimeric molecules could not stimulate T cells even when cocultured in the presence of BJAB (Fig. 7⇓A). Using the Ii-specific Pin.1 mAb on immunoblots, we found that the chimeric molecules migrated at the expected Mr of ∼45 kDa, and no degradation products were detected (Fig. 7⇓B and data not shown). The chimeric molecules were almost undetectable by flow cytometry and fluorescence microscopy, suggesting that the vSAg portion imparts instability to the constructs (data not shown). Sorting vSAg7 to endosomes destroys its activity. A, Direct (endogenous) and indirect (transfer) presentation of chimeric p33cyto-vSAg7 and p35cyto-vSAg7 molecules by transfected DAP DR1 cells. B, Immunoblot analysis using Pin.1 mAb of the cells shown in A. vSAg-negative DAP DR1 cells were used as a control. C, HEK 293T cells were transiently transfected with p33cyto-vSAg7 or p35cyto-vSAg7 chimeric molecules. Cells were permeabilized, stained with Pin.1, and analyzed by fluorescence microscopy. White arrows indicate the presence of large vesicles in the cytoplasm. D, Mock or transfected HEK 293T cells were permeabilized and stained using the Pin.1 Ab specific for the cytoplasmic tail of all Ii isoforms. To circumvent the problem of low protein expression, we turned to transient overexpression in human HEK 293T cells. Two days after transfection in the absence of class II molecules, cells were split and tested in a functional transfer assay (data not shown) or were analyzed by fluorescence microscopy and flow cytometry (Fig. 7⇑, C and D). In contrast to wild-type vSAg7, the chimeric molecules were not transferred from 293T cells to BJAB. Pin.1 staining showed that the chimeric p33 cyto-vSAg7 molecule was expressed and transported to punctate vesicles scattered in the cytoplasm. Importantly, to demonstrate the specificity of this distribution, we tested a similar construct between Iip35 and vSAg7 (p35 cyto-vSAg7). As expected from the fact that this Ii isoform is retained in the ER in the absence of DR (107), the staining was diffuse and did not show any defined vesicles (Fig. 7⇑C). Together, these results suggest that the small amount of vSAg destined for T cell stimulation must not be sorted to the endocytic pathway even in the presence of class II molecules. Structure-function aspects of SAgs have been mostly studied in the past using MHC class II-transfected cells. For example, by analogy to the hierarchy described for the H-2 gene products, murine DAP cells have been used to demonstrate isotypic variations in the capacity of human class II molecules to present vSAgs (95). These cells do not express Ii or DM, but still present vSAgs very efficiently when transfected with HLA-DR. However, the situation was very different when we used a series of HeLa cell transfectants for study of the vSAg binding site on those exact same class II molecules. In such conditions, we found that the human epithelial cell line is incapable of presenting endogenous vSAgs. It has been reported that MMTV preferentially infects immature DCs as well as B cells, and that both APCs lead to Vβ-specific T cell activation (108). Accordingly, when the prototypic human B cell line Raji was tested for endogenous vSAg7 presentation, efficient T cell stimulation was measured. We identified CIITA as being responsible for activating the class II processing pathway and for the efficient vSAg presentation. This effect was mainly due to the up-regulation of HLA-DM and Ii. From our results, we cannot rule out additional CIITA-mediated effects on the processing or sorting of vSAgs, because this transactivator was shown to modulate the expression of >50 genes in B cells (105). However, given the fact that all other CIITA-negative vSAg+ HeLa transfectants very efficiently transferred the activity, this hypothesis is unlikely. Comparing the ability of primary B cells from CIITA− vs CIITA+class II− mice to transfer vSAg might shed light on this issue. The presentation efficiency of HeLa CIITA and Raji most certainly relies in part on their very high levels of surface class II compared with the DR/DM/Ii transfectants. Also, the relative expressions of class II, Ii, and DM is probably optimal under CIITA control compared with the situation in HeLa cells where transfected molecules are transcribed from a variety of promoters and by different vectors integrated randomly at various copy numbers. Our results clearly showed that the expression of DM and Ii was sufficient to rescue vSAg presentation in HeLa DR1 cells. This finding is reminiscent of the important peptide/class II conformation for the binding of bacterial SAgs (44). For example, TSST-1 binding to class II is greatly augmented by the transfection of Ii and DM in DR+ T2 cells (41, 46). Indeed, Wen et al. (42, 43) demonstrated unambiguously that TSST-1 binding is affected by the class II-bound peptides. Interestingly, it was recently shown that the presentation of both vSAgs and TSST-1 is diminished in mice deficient for DM or Ii, suggesting that a diverse class II peptide repertoire is needed for these SAgs to bind APCs (71). At first glance, our results are in line with these in vivo studies. At the surface of chaperone-negative HeLa DR cells, the class II molecules are loaded with large ER polypeptides that could interfere with binding of vSAgs (46). However, polypeptides are also found in class II molecules expressed at the surface of DAP cells (10). Nevertheless, in both cell lines there are clearly some SDS-stable compact forms migrating at 55 kDa, which most certainly correspond to class II molecules loaded with some relatively short peptides (Fig. 2⇑). Cell type differences may explain the fact that mouse cells display some permissive peptide(s) or polypeptide(s) allowing vSAg presentation. Mass spectrometry analyses will give clues about the degree of heterogeneity of these class II ligands. The need for a diverse peptide repertoire could explain why coexpression of Ii, which displaces large polypeptides found in the ER, did not restore vSAg presentation in DR+ HeLa cells. For DM KO mice, this configuration results in the display of class II molecules bound almost exclusively with the CLIP peptide. Introducing DM in these cells could restore presentation through CLIP displacement and the binding of vSAg-permissive peptides. However, Hsu et al. (72) reported that DM-negative B cells expressing copious amounts of DR3-CLIP complexes are still capable of presenting endogenous vSAgs. Also, the surprising finding reported here that a dileucine motif in the tail of DR could restore presentation warrants evaluating alternative explanations for the need of displacing CLIP. Indeed, the majority, if not the totality, of class II molecules on the HeLa DR1-LL Ii cells are loaded with the CLIP peptide and present vSAgs. Because both lines are expressing DR-CLIP at their surface, what differentiates these complexes between HeLa DR Ii and HeLa DR1-LL Ii cells? Possibly the isoform of CLIP found on HeLa DR Ii cells (or on APCs from DM KO mice) is not permissive for vSAg binding. CLIP is usually found as a nested set of peptides on class II molecules, and N- or C-terminal extensions outside the peptide binding groove have been shown to inhibit SEB binding to class II molecules (109). HeLa cells, which are devoid of cathepsin S (110), may generate a form of CLIP incompatible with vSAg binding. This may explain why replacing in Ii the core CLIP sequence with a variety of defined DR-binding motifs did not restore vSAg binding (data not shown). To allow presentation, nonpermissive CLIPs must be either displaced by DM or, in the context of the DR1-LL construct, be trimmed to competent forms by lysosomal exopeptidases. We have previously shown that this chimeric DR1-LL accumulates in large quantities in endocytic vesicles containing markers of late endosomes (77). Despite a prolonged stay in these vesicles, these molecules recycle, because they are found in large amounts at the cell surface. HPLC analysis of the peptides found in DR vs DR1-LL would help resolve the issue of CLIP heterogeneity. Alternatively to the trimming of CLIP, the trafficking of DR1-LL through late vesicles might allow binding of some functionally relevant peptides after long-standing exposure to acidic pH. Such a mechanism could explain the indispensable need for Ii, which will incorporate in DR the more easily exchangeable CLIP peptide. In this context, it will be interesting to test the presentation of vSAg by HeLa cells expressing Ii and an allele such as DR4, which releases CLIP spontaneously (111). Whether DR1-LL could also bypass the need for DM in the presentation of DM-dependent nominal Ags remains to be tested. Although its influence seems clear in many experimental systems, it is still possible that DM plays a role beyond its peptide-editing activity. Looking at bacterial superantigen, Ab, or TCR recognition of class II molecules, recent evidence strongly suggests that DM might directly influence the structure of class II molecules (34, 35, 36). However, the mechanism underlying this new DM attribute remains unknown. In the case of vSAg presentation by HeLa cells, a contact-induced, peptide-independent role of DM on the structure of DR would be difficult to reconcile with the fact that an LL motif on DR compensates for the absence of the nonclassical class II chaperone. Also, the cell type dependency for DM is intriguing. If one considers a role for DM on the structure of class II molecules, then what could be compensating for DM and Ii in DAP, COS, and CHO cells, which all stimulate T cells upon transfection of vSAgs and DR? The most likely explanation is that in these permissive cells, HLA-DR could undergo a conformation modification mediated by some enzymes, tetraspans, chaperones, or severe pH conditions. For example, as opposed to HeLa cells, murine cells allow class II molecules to accumulate in the endocytic pathway in the absence of Ii (20). In nonpermissive cells, DM could affect the sorting of DR by dragging some molecules to the highly acidic lysosomes before their dissociation. Nevertheless, our observations describe the essential role of the endocytic pathway in the presentation of endogenous vSAgs. These results are in line with those reported by Golovkina et al. (71) showing the importance of peptides in vSAg presentation and those of Grigg et al. (70) showing that vSAgs interact with mature class II molecules and only at the cell surface. Our results contrast with those of Hsu et al. (72) describing a DM-independent vSAg presentation pathway. The straightforward model that they proposed suggests that vSAgs bare an essential and specific motif that interacts with newly formed class II heterodimers in a CLIP-like manner. We cannot formally rule out that DR and vSAgs associate in the ER of HeLa cells in the absence of Ii and DM, but these complexes are nonfunctional. Also, vSAg molecules following DR (especially DR-LL) to endosomes would probably be degraded, as previously suggested (70). Indeed, replacing the cytoplasmic tail of vSAg for that of Iip33 completely abolished the ability of the vSAg to stimulate T cells in direct or transfer assays (Fig. 7⇑). This last result suggests that if vSAgs gain access to the endocytic pathway, their passage must be swift and is probably not compatible with their intercalation in a putative class II-Ii-MTV nonamer. In furin-negative cells, it was proposed that alternative cleavage by cathepsins could generate an active form of vSAg (62, 63). HEK 293T cells are furin negative, and the efficient transfer of vSAg is in accordance with the existence of alternative cleavage sites. However, the fact that a soluble fragment is not released from cells expressing the chimeric Ii-vSAg suggests that the cleavage does not occur in endosomes. Alternatively, the transferred C-terminal part of the open reading frame product may need to remain associated to the N-terminal part of the vSAg and be re-expressed at the surface, a step that is precluded by the endosomal retention motif in our chimera. Finally, the binding of vSAg in an Ii-like fashion would imply a direct competition between the two molecules for class II binding. However, DAP cells expressing high levels of IiΔ20 (which lacks endosomal sorting motifs and stays associated with DR from the ER to the cell surface) stimulate T cells as efficiently as their Ii-negative counterpart (J. Thibodeau and R.-P. Sékaly, unpublished observations). In conclusion, our results support a model in which vSAgs travel on their own to the plasma membrane, where they encounter mature class II molecules. Binding and presentation of the vSAg depend on the nature of the stably bound class II peptides, which are acquired in various compartments and may be homogeneous under certain experimental conditions. We thank Alexandre Brunet for helping with the characterization of chimeric molecules. We also thank Drs. F. Denis, G. Winslow, O. Bakke, D. L. Hardie, I. C. MacLennan, P. Cresswell, E. O. Long, P. Belhumeur, J. Kappler, P. Marrack, L. K. Denzin, and E. Cohen for plasmids, Abs, hybridomas, and cell lines. ↵1 This work was supported by a grant from the Canadian Institutes for Health Research. R.P.S. holds a Canadian Research Chair in human immunology. J.T. is supported by a senior fellowship from the Fonds de la Recherche en Santé du Québec. ↵3 Abbreviations used in this paper: SAg, superantigen; bSAg, bacterial SAg; DC, dendritic cell; ER, endoplasmic reticulum; Ii, invariant chain; KO, knockout; MMTV, mouse mammary tumor virus; MTV7, mammary tumor virus superantigen 7; SEB, staphylococcal enterotoxin B; vSAg7, viral SAg7. Papageorgiou, A. C., K. R. Acharya. 2000. Microbial superantigens: from structure to function. Trends Microbiol. 8: 369-375. Fraser, J., V. Arcus, P. Kong, E. Baker, T. Proft. 2000. Superantigens: powerful modifiers of the immune system. Mol. Med. Today 6: 125-132. Kotzin, B. L., D. Y. M. Leung, J. Kappler, P. Marrack. 1993. Superantigens and their potential role in human disease. Adv. Immunol. 54: 99-166. Llewelyn, M., J. Cohen. 2002. Superantigens: microbial agents that corrupt immunity. Lancet Infect. Dis. 2: 156-162. Thibodeau, J., I. Cloutier, P. M. Lavoie, N. Labrecque, W. Mourad, T. Jardetzky, R.-P. Sekaly. 1994. Subsets of HLA-DR1 molecules defined by SEB and TSST-1 binding. Science 266: 1874-1878. Castellino, F., G. M. Zhong, R. N. Germain. 1997. Antigen presentation by MHC class II molecules: invariant chain function, protein trafficking, and the molecular basis of diverse determinant capture. Hum. Immunol. 54: 159-169. Cresswell, P.. 1996. Invariant chain structure and MHC class II function. Cell 84: 505-507. Wolf, P. R., H. L. Ploegh. 1995. How MHC class II molecules acquire peptide cargo: biosynthesis and trafficking through the endocytic pathway. Annu. Rev. Cell. Dev. Biol. 11: 267-306. Busch, R., I. Cloutier, R.-P. Sekaly, G. J. Hammerling. 1996. Invariant chain protects class II histocompatibility antigens from binding intact polypeptides in the endoplasmic reticulum. EMBO J. 15: 418-428. Roche, P. A., P. Cresswell. 1990. Invariant chain association with HLA-DR molecules inhibits immunogenic peptide binding. Nature 345: 615-618. Romagnoli, P., R. N. Germain. 1994. The CLIP region of invariant chain plays a critical role in regulating major histocompatibility complex class II folding, transport, and peptide occupancy. J. Exp. Med. 180: 1107-1113. Bakke, O., B. Dobberstein. 1990. MHC class II-associated invariant chain contains a sorting signal for endosomal compartments. Cell 63: 707-716. Lotteau, V., L. Teyton, A. Peleraux, T. Nilsson, L. Karlsson, S. L. Schmid, V. Quaranta, P. A. Peterson. 1990. Intracellular transport of class II MHC molecules directed by invariant chain. Nature 348: 600-605. Pieters, J., O. Bakke, B. Dobberstein. 1993. The MHC class II-associated invariant chain contains two endosomal targeting signals within its cytoplasmic tail. J. Cell Sci. 106: 831-846. Viville, S., J. J. Neefjes, V. Lotteau, A. Dierich, M. Lemeur, H. Ploegh, C. Benoist, D. Mathis. 1993. Mice lacking the MHC class II-associated invariant chain. Cell 72: 635-648. Rovere, P., F. Forquet, V. S. Zimmermann, J. Trucy, P. Ricciardi-Castagnoli, J. Davoust. 1997. Dendritic cells from mice lacking the invariant chain express high levels of membrane MHC class II molecules in vivo. Adv. Exp. Med. Biol. 417: 195-201. Sekaly, R.-P., C. Tonnelle, M. Strubin, B. Mach, E. O. Long. 1986. Cell surface expression of class II histocompatibility antigens occurs in the absence of the invariant chain. J. Exp. Med. 164: 1490-1504. Miller, J., R. N. Germain. 1986. Efficient cell surface expression of class II MHC molecules in the absence of associated invariant chain. J. Exp. Med. 164: 1478-1489. Simonsen, A., F. Momburg, J. Drexler, G. J. Hammerling, O. Bakke. 1993. Intracellular distribution of the MHC class II molecules and the associated invariant chain (Ii) in different cell lines. Int. Immunol. 5: 903-917. Matza, D., A. Kerem, I. Shachar. 2003. Invariant chain, a chain of command. Trends Immunol. 24: 264-268. Denzin, L. K., P. Cresswell. 1995. HLA-DM induces CLIP dissociation from MHC class II αβ dimers and facilitates peptide loading. Cell 82: 155-165. Sherman, M. A., D. A. Weber, P. E. Jensen. 1995. DM enhances peptide binding to class II MHC by release of invariant chain-derived peptide. Immunity 3: 197-205. Sanderson, F., M. J. Kleijmeer, A. Kelly, D. Verwoerd, A. Tulp, J. J. Neefjes, H. J. Geuze, J. Trowsdale. 1994. Accumulation of HLA-DM, a regulator of antigen presentation, in MHC class II compartments. Science 266: 1566-1569. Karlsson, L., A. Péléraux, R. Lindstedt, M. Liljedahl, P. A. Peterson. 1994. Reconstitution of an operational MHC class II compartment in nonantigen-presenting cells. Science 266: 1569-1573. Sanderson, F., S. H. Powis, A. P. Kelly, J. Trowsdale. 1994. Limited polymorphism in HLA-DM does not involve the peptide binding groove. Immunogenetics 39: 56-58. Copier, J., M. J. Kleijmeer, S. Ponnambalam, V. Oorschot, P. Potter, J. Trowsdale, A. Kelly. 1996. Targeting signal and subcellular compartments involved in the intracellular trafficking of HLA-DMB. J. Immunol. 157: 1017-1027. Lindstedt, R., M. Liljedahl, A. Peleraux, P. A. Peterson, L. Karlsson. 1995. The MHC class II molecule H2-M is targeted to an endosomal compartment by a tyrosine-based targeting motif. Immunity 3: 561-572. Marks, M. S., P. A. Roche, E. van Donselaar, L. Woodruff, P. J. Peters, J. S. Bonifacino. 1995. A lysosomal targeting signal in the cytoplasmic tail of the β chain directs HLA-DM to MHC class II compartments. J. Cell Biol. 131: 351-369. Sloan, V. S., P. Cameron, G. Porter, M. Gammon, M. Amaya, E. Mellins, D. M. Zaller. 1995. Mediation by HLA-DM of dissociation of peptides from HLA-DR. Nature 375: 802-806. Van Ham, S. M., U. Grueneberg, G. Malcherek, I. Broeker, A. Melms, J. Trowsdale. 1996. Human histocompatibility leukocyte antigen (HLA)-DM edits peptides presented by HLA-DR according to their ligand binding motifs. J. Exp. Med. 184: 2019-2024. Weber, D. A., B. D. Evavold, P. E. Jensen. 1996. Enhanced dissociation of HLA-DR-bound peptides in the presence of HLA-DM. Science 274: 618-620. Albert, L. J., L. K. Denzin, B. Ghumman, N. Bangia, P. Cresswell, T. H. Watts. 1998. Quantitative defect in staphylococcal enterotoxin A binding and presentation by HLA-DM-deficient T2. Ak cells corrected by transfection of HLA-DM genes. Cell. Immunol. 183: 42-51. Verreck, F. A., C. A. Fargeas, G. J. Hammerling. 2001. Conformational alterations during biosynthesis of HLA-DR3 molecules controlled by invariant chain and HLA-DM. Eur. J. Immunol. 31: 1029-1036. Pu, Z., S. B. Lovitch, E. K. Bikoff, E. R. Unanue. 2004. T cells distinguish MHC-peptide complexes formed in separate vesicles and edited by H2-DM. Immunity 20: 467-476. Cole, B. C., B. A. Araneo, G. J. Sullivan. 1986. Stimulation of mouse lymphocytes by a mitogen derived from Mycoplasma arthritidis. IV. Murine T hybridoma cells exhibit differential accessory cell requirements for activation by M. arthritidis T cell mitogen, concanavalin A, or hen egg-white lysozyme. J. Immunol. 136: 3572-3578. Fleischer, B., H. Schrezenmeier. 1988. T cell stimulation by staphylococcal enterotoxins: clonally variable response and requirement for major histocompatibility complex class II molecules on accessory or target cells. J. Exp. Med. 167: 1697-1707. Dellabona, P., J. Peccoud, J. Kappler, P. Marrack, C. Benoist, D. Mathis. 1990. Superantigens interact with MHC class II molecules outside of the antigen groove. Cell 62: 1115-1121. Kozono, H., D. Parker, J. White, P. Marrack, J. Kappler. 1995. Multiple binding sites for bacterial superantigens on soluble class II major histocompatibility complex molecules. Immunity 3: 187-196. Von Bonin, A., S. Ehrlich, G. Malcherek, B. Fleischer. 1995. Major histocompatibility complex class II-associated peptides determine the binding of the superantigen toxic shock syndrome toxin-1. Eur. J. Immunol. 25: 2894-2898. Wen, R., G. A. Cole, S. Surman, M. A. Blackman, D. L. Woodland. 1996. Major histocompatibility complex class II-associated peptides control the presentation of bacterial superantigens to T cells. J. Exp. Med. 183: 1083-1092. Wen, R., D. R. Broussard, S. Surman, T. L. Hogg, M. A. Blackman, D. L. Woodland. 1997. Carboxy-terminal residues of major histocompatibility complex class II-associated peptides control the presentation of the bacterial superantigen toxic shock syndrome toxin-1 to T cells. Eur. J. Immunol. 27: 772-781. Woodland, D. L., R. Wen, M. A. Blackman. 1997. Why do superantigens care about peptides?. Immunol. Today 18: 18-22. Etongue-Mayer, P., M. A. Langlois, M. Ouellette, H. Li, S. Younes, R. Al Daccak, W. Mourad. 2002. Involvement of zinc in the binding of Mycoplasma arthritidis-derived mitogen to the proximity of the HLA-DR binding groove regardless of histidine 81 of the β chain. Eur. J. Immunol. 32: 50-58. Lavoie, P. M., J. Thibodeau, I. Cloutier, R. Busch, R. P. Sekaly. 1997. Selective binding of bacterial toxins to major histocompatibility complex class II-expressing cells is controlled by invariant chain and HLA-DM. Proc. Natl. Acad. Sci. USA 94: 6892-6897. Langlois, M. A., P. Etongue-Mayer, M. Ouellette, W. Mourad. 2000. Binding of Mycoplasma arthritidis-derived mitogen to human MHC class II molecules via its N terminus is modulated by invariant chain expression and its C terminus is required for T cell activation. Eur. J. Immunol. 30: 1748-1756. Kim, J., R. G. Urban, J. L. Strominger, D. C. Wiley. 1994. Crystallographic structure of toxic shock syndrome toxin-1 complexed with a human class II major histocompatibility molecule HLA-DR1. Science 266: 1870-1874. Li, Y., H. Li, N. Dimasi, J. K. McCormick, R. Martin, P. Schuck, P. M. Schlievert, R. A. Mariuzza. 2001. Crystal structure of a superantigen bound to the high-affinity, zinc-dependent site on MHC class II. Immunity 14: 93-104. Petersson, K., M. Hakansson, H. Nilsson, G. Forsberg, L. A. Svensson, A. Liljas, B. Walse. 2001. Crystal structure of a superantigen bound to MHC class II displays zinc and peptide dependence. EMBO J. 20: 3306-3312. Zhao, Y., Z. Li, S. J. Drozd, Y. Guo, W. Mourad, H. Li. 2004. Crystal structure of Mycoplasma arthritidis mitogen complexed with HLA-DR1 reveals a novel superantigen fold and a dimerized superantigen-MHC complex. Structure 12: 277-288. Acha-Orbea, H., W. Held, G. A. Waanders, A. N. Shakhov, L. Scarpellino, R. K. Lees, H. R. MacDonald. 1993. Exogenous and endogenous mouse mammary tumor virus superantigens. Immunol. Rev. 131: 5-25. Held, W., A. N. Shakhov, S. Izui, G. A. Waanders, L. Scarpellino, H. R. MacDonald, H. Acha-Orbea. 1993. Superantigen-reactive CD4+ T cells are required to stimulate B cells after infection with mouse mammary tumor virus. J. Exp. Med. 177: 359-366. Held, W., G. A. Waanders, A. N. Shakhov, L. Scarpellino, H. Acha-Orbea, H. R. MacDonald. 1993. Superantigen-induced immune stimulation amplifies mouse mammary tumour virus infection and allows virus transmission. Cell 74: 529-540. Choi, Y., J. W. Kappler, P. Marrack. 1991. A superantigen encoded in the open reading frame of the 3′ long terminal repeat of mouse mammary tumour virus. Nature 350: 203-207. Woodland, D. L., F. E. Lund, M. P. Happ, M. A. Blackman, E. Palmer, R. B. Corley. 1991. Endogeneous superantigen expression is controlled by mouse mammary tumor proviral loci. J. Exp. Med. 174: 1255-1258. Beutner, U., W. N. Frankel, M. S. Cote, J. M. Coffin, B. T. Huber. 1992. Mls-1 is encoded by the long terminal repeat open reading frame of the mouse mammary tumor provirus mtv-7. Proc. Natl. Acad. Sci. USA 89: 5432-5436. Knight, A. M., G. B. Harrison, R. J. Paese, P. J. Robinson, P. J. Dyson. 1992. Biochemical analysis of the mouse mammary tumor virus long terminal repeat product: evidence for the molecular structure of an endogenous superantigen. Eur. J. Immunol. 22: 879-882. Korman, A. J., P. Bourgarel, T. Meo, G. E. Rieckhof. 1992. The mouse mammary tumour virus long terminal repeat encodes a type II transmembrane glycoprotein. EMBO J. 11: 1901-1905. Park, C. G., M.-Y. Jung, Y. Choi, G. M. Winslow. 1995. Proteolytic processing is required for viral superantigen activity. J. Exp. Med. 181: 1899-1904. Reilly, M., D. Mix, G. M. Winslow. 2000. Detection of viral superantigen-class II MHC interactions at the cell surface. Mol. Immunol. 37: 987-993. Mix, D., G. M. Winslow. 1996. Proteolytic processing activates a viral superantigen. J. Exp. Med. 184: 1549-1554. Denis, F., N. H. Shoukry, M. Delcourt, J. Thibodeau, N. Labrecque, H. McGrath, J. S. Munzer, N. G. Seidah, R. P. Sekaly. 2000. Alternative proteolytic processing of mouse mammary tumor virus superantigens. J. Virol. 74: 3067-3073. Speiser, D. E., R. Schneider, H. Hengartner, H. R. MacDonald, R. M. Zinkernagel. 1989. Clonal deletion of self-reactive T cells in irradiation bone marrow chimeras and neonatally tolerant mice: evidence for intercellular transfer of Mlsa. J. Exp. Med. 170: 595-600. Delcourt, M., J. Thibodeau, F. Denis, R. P. Sekaly. 1997. Paracrine transfer of mouse mammary tumor virus superantigen. J. Exp. Med. 185: 471-480. Reilly, M., D. Mix, A. A. Reilly, Y. Yang, Y. X, G. M. Winslow. 2000. Intercellular transfer of a soluble viral superantigen. J. Virol. 74: 8262-8267. Torres, B. A., N. D. Griggs, H. M. Johnson. 1993. Bacterial and retroviral superantigens share a common binding region on class II MHC antigens: bacterial and retroviral superantigens share a common binding region on class II MHC antigens. Nature 364: 152-154. Thibodeau, J., N. Labrecque, F. Denis, B. T. Huber, R.-P. Sekaly. 1994. Binding sites for bacterial and endogenous retroviral superantigens can be dissociated on major histocompatibility complex class II molecules. J. Exp. Med. 179: 1029-1034. Mottershead, D. G., P.-N. Hsu, R. G. Urban, J. L. Strominger, B. T. Huber. 1995. Direct binding of the Mtv7 superantigen (Mls-1) to soluble MHC class II molecules. Immunity 2: 149-154. Grigg, M. E., C. W. McMahon, S. Morkowski, A. Y. Rudensky, A. M. Pullen. 1998. Mtv-1 superantigen trafficks independently of major histocompatibility complex class II directly to the B-cell surface by the exocytic pathway. J. Virol. 72: 2577-2588. Golovkina, T. V., Y. Agafonova, D. Kazansky, A. Chervonsky. 2001. Diverse repertoire of the MHC class II-peptide complexes is required for presentation of viral superantigens. J. Immunol. 166: 2244-2250. Hsu, P. N., B. P. Wolf, N. Sutkowski, B. Mclellan, H. L. Ploegh, B. T. Huber. 2001. Association of mouse mammary tumor virus superantigen with MHC class II during biosynthesis. J. Immunol. 166: 3309-3314. Gunning, P., J. Leavitt, G. Muscat, S. Y. Ng, L. Kedes. 1987. A human β-actin expression vector system directs high-level accumulation of antisense transcripts. Proc. Natl. Acad. Sci. USA 84: 4831-4835. Labrecque, N., H. McGrath, M. Subramanyam, B. T. Huber, R.-P. Sekaly. 1993. Human T cells respond to mouse mammary tumour virus encoded superantigen: Vβ restriction and conserved evolutionnary features. J. Exp. Med. 177: 1735-1743. Faubert, A., A. Samaan, J. Thibodeau. 2002. Functional analysis of tryptophans α62 and β120 on HLA-DM. J. Biol. Chem. 277: 2750-2755. Khalil, H., A. Brunet, I. Saba, R. Terra, R. P. Sekaly, J. Thibodeau. 2003. The MHC class II β chain cytoplasmic tail overcomes the invariant chain p35-encoded endoplasmic reticulum retention signal. Int. Immunol. 15: 1249-1263. Brunet, A., A. Samaan, F. Deshaies, T. J. Kindt, J. Thibodeau. 2000. Functional characterization of a lysosomal sorting motif in the cytoplasmic tail of HLA-DOβ. J. Biol. Chem. 275: 37062-37071. Ho, S. N., H. D. Hunt, R. M. Horton, J. K. Pullen, L. R. Pease. 1989. Site-directed mutagenesis by overlap extension using the polymerase chain reaction. Gene 77: 51-59. Takebe, Y., M. Seiki, J. Fujisawa, P. Hoy, K. Yokota, K. Arai, M. Yoshida, N. Arai. 1988. SRα promoter: an efficient and versatile mammalian cDNA expression system composed of the simian virus 40 early promoter and the R-U5 segment of human T-cell leukemia virus type 1 long terminal repeat. Mol. Cell. Biol. 8: 466-472. Winslow, G. M., P. Marrack, J. W. Kappler. 1994. Processing and major histocompatibility complex binding of the MTV7 superantigen. Immunity 1: 23-33. Fu, X. T., R. W. Karr. 1994. HLA-DR α chain residues located on the outer loops are involved in nonpolymorphic and polymorphic antibody-binding epitopes. Hum. Immunol. 39: 253-260. Charron, D. J., H. O. McDevitt. 1979. Analysis of HLA-D region-associated molecules with monoclonal antibody. Proc. Natl. Acad. Sci. USA 76: 6567-6571. Radka, S. F., C. E. Machamer, P. Cresswell. 1984. Analysis of monoclonal antibodies reactive with human class II β chains by two-dimensional electrophoresis and western blotting. Hum. Immunol. 10: 177-188. Wraight, C. J., P. Van Endert, P. Moller, J. Lipp, N. R. Ling, I. C. MacLennan, N. Koch, G. Moldenhauer. 1990. Human major histocompatibility complex class II invariant chain is expressed on the cell surface. J. Biol. Chem. 265: 5787-5792. Roche, P. A., M. S. Marks, P. Cresswell. 1991. Identification of the HLA class II-invariant chain complex as a nine subunit transmembrane glycoprotein. Nature 354: 392-394. Shookster, L., T. Matsuyama, G. Burmester, R. Winchester. 1987. Monoclonal antibody 1a3 recognizes a monomorphic epitope unique to DQ molecules. Hum. Immunol. 20: 59-70. Menezes, J., W. Leibold, G. Klein, G. Clements. 1975. Establishment and characterization of an Epstein-Barr virus (EBC)-negative lymphoblastoid B cell line (BJA-B) from an exceptional, EBV-genome-negative African Burkitt’s lymphoma. Biomedicine 22: 276-284. Roche, P. A., C. L. Teletski, D. R. Karp, V. Pinet, O. Bakke, E. O. Long. 1992. Stable surface expression of invariant chain prevents peptide presentation by HLA-DR. EMBO J. 11: 2841-2847. Herman, A., G. Croteau, R.-P. Sekaly, J. Kappler, P. Marrack. 1990. HLA-DR alleles differ in their ability to present staphylococcal enterotoxins to T cells. J. Exp. Med. 172: 709-717. Lamarre, D., D. J. Capon, D. R. Karp, T. Gregory, E. Long, R. P. Sekaly. 1989. Class II MHC molecules and the HIV gp120 envelope protein interact with functionally distinct regions of the CD4 molecule. EMBO J. 8: 3271-3277. Kanagawa, O., R. Maki. 1989. Inhibition of MHC class II-restricted T cell response by Lyt-2 alloantigen. J. Exp. Med. 170: 901-912. Azar, G. A., J. Thibodeau. 2002. Human endogenous retrovirus IDDMK(1,2)22 and mouse mammary tumor virus superantigens differ in their ability to stimulate murine T cell hybridomas. Immunol. Lett. 81: 87-91. Graham, F. L., A. J. van der Eb. 1973. Transformation of rat cells by DNA of human adenovirus 5. Virology 54: 536-539. Khalil, H., F. Deshaies, A. Bellemare-Pelletier, A. Brunet, A. Faubert, G. A. Azar, J. Thibodeau. 2002. Class II transactivator-induced expression of HLA-DOβ in HeLa cells. Tissue Antigens 60: 372-382. Subramanyam, M., B. Mclellan, N. Labrecque, R.-P. Sekaly, B. T. Huber. 1993. 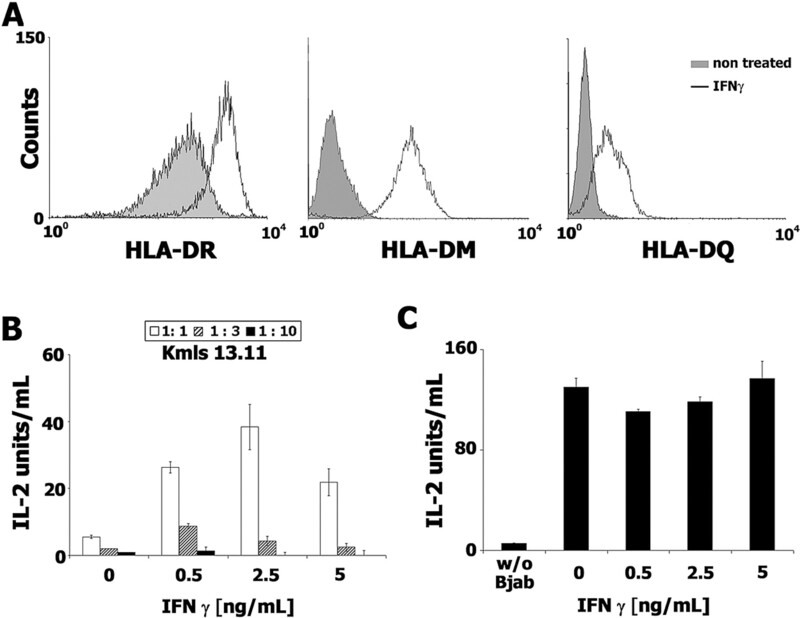 Presentation of the Mls-1 superantigen by human HLA class II molecules to murine T cells. J. Immunol. 151: 2538-2545. Scherer, M. T., L. Ignatowicz, A. Pullen, J. Kappler, P. Marrack. 1995. The use of mammary tumor virus (Mtv)-negative and single-Mtv mice to evaluate the effects of endogenous viral superantigens on the T cell repertoire. J. Exp. Med. 182: 1493-1504. Lund, F. E., T. Randall, D. L. Woodland, R. B. Corley. 1993. MHC class II limits the functional expression of endogeous superantigens in B cells. J. Immunol. 150: 78-86. Roucard, C., F. Garban, N. A. Mooney, D. J. Charron, M. L. Ericson. 1996. Conformation of human leukocyte antigen class II molecules: evidence for superdimers and empty molecules on human antigen presenting cells. J. Biol. Chem. 271: 13993-14000. Busch, R., I. Y. Vturina, J. Drexler, F. Momburg, G. J. Hammerling. 1995. Poor loading of major histocompatibility complex class II molecules with endogenously synthesized short peptides in the absence of invariant chain. Eur. J. Immunol. 25: 48-53. Stumptner-Cuvelette, P., S. Morchoisne, M. Dugast, S. Le Gall, G. Raposo, O. Schwartz, P. Benaroch. 2001. HIV-1 Nef impairs MHC class II antigen presentation and surface expression. Proc. Natl. Acad. Sci. USA 98: 12144-12149. Acha-Orbea, H., H. R. MacDonald. 1995. Superantigens of mouse mammary tumor virus. Annu. Rev. Immunol. 13: 459-486. Golovkina, T. V., A. Chervonsky, J. P. Dudley, S. R. Ross. 1992. Transgenic mouse mammary tumor virus superantigen expression prevents viral infection. Cell 69: 637-645. Steimle, V., C.-A. Siegrist, A. Mottet, B. Lisowska-Grospierre, B. Mach. 1994. Regulation of MHC class II expression by interferon-γ mediated by the transactivator gene CIITA. Science 265: 106-109. Nagarajan, U. M., A. Bushey, J. M. Boss. 2002. Modulation of gene expression by the MHC class II transactivator. J. Immunol. 169: 5078-5088. Odorizzi, C. G., I. S. Trowbridge, L. Xue, C. R. Hopkins, C. D. Davis, J. F. Collawn. 1994. Sorting signals in the MHC class II invariant chain cytoplasmic tail and transmembrane region determine trafficking to an endocytic processing compartment. J. Cell Biol. 126: 317-330. Newcomb, J. R., P. Cresswell. 1993. Structural analysis of proteolytic products of MHC class II-invariant chain complexes generated in vivo. J. Immunol. 151: 4153-4163. Vacheron, S., S. A. Luther, H. Acha-Orbea. 2002. Preferential infection of immature dendritic cells and B cells by mouse mammary tumor virus. J. Immunol. 168: 3470-3476. Vogt, A. B., L. J. Stern, C. Amshoff, B. Dobberstein, G. J. Hammerling, H. Kropshofer. 1995. Interference of distinct invariant chain regions with superantigen contact area and antigenic peptide binding groove of HLA-DR. J. Immunol. 155: 4757-4765. Bania, J., E. Gatti, H. Lelouard, A. David, F. Cappello, E. Weber, V. Camosseto, P. Pierre. 2003. Human cathepsin S, but not cathepsin L, degrades efficiently MHC class II-associated invariant chain in nonprofessional APCs. Proc. Natl. Acad. Sci. USA 100: 6664-6669. Stebbins, C. C., G. E. Loss, Jr, C. G. Elias, A. Chervonsky, A. J. Sant. 1995. The requirement for DM in class II-restricted antigen presentation and SDS-stable dimer formation is allele and species dependent. J. Exp. Med. 181: 223-234.